Need to plan an event for your company to show employees you care about them? Why not plan a company picnic. It seems in today's hustle-bustle society, the morale of your employees gets lower and lower, often times as a direct effect of productivity demands getting higher and higher coupled with cost-cutting measures getting stricter and stricter. With all that said, many human resource departments are looking for ways to boost morale on a shoestring budget. Have little or no money? Need to plan an event for your company to show employees you care about them as people? Why not re-visit a century-old idea like the company picnic? Company picnics don't have to be expensive! How about the lunchroom of your company? Too busy for a picnic? Rainy Monday? Try throwing a checkered tablecloth on the table, make a few of the 'Ant treats' (see the Picnic Ideas article for recipes!) and violaa company picnic! Your employees can eat their regular lunch in a picnic atmosphere, and smile for the rest of the day. How about on the patio or grassy area of your business? If you are a business owner fortunate enough to have an outdoor patio or even a patch of grass, there is another ideal place for a mid-day break for your hard working employees. Add some spice to this company picnic by serving up some chilled apple cider. You can even serve up a sandwich tray. Needing a tax write-off? 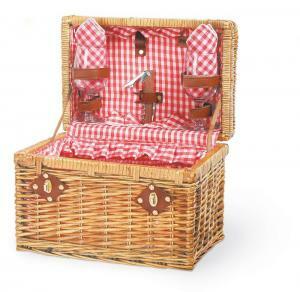 Invite a few of your best customers, make them a picnic basket or backpack, and call it an entertainment expense! Your nearest Theme Park! This one is a bit more than a shoestring budget, but for those hard working employees, often times the way to relax is to get out and play! Many theme parks have package prices for large groups and some will even provide transportation to their park for your company picnic. This company picnic is a great idea to get your employees in touch with their kids and have a rip-roaring good time. Besides, we all want to see the picture of our boss with the 'what have I done?' look on their face as they go over the edge of the high drop on a roller coaster. What a great picture that will be to pin up on the bulletin board in the office lounge! Don't know what is near? Access http://www.themeparksonline.org/parklist.asp for a list of parks near you! Let's face it: today's employees have it pretty rough. The productivity demands of companies are rising, while employee morale is falling. A perfect way to mitigate this is to use a century-old idea - the company picnic! Planning an effective company picnic is not as difficult or expensive as you might think, and your employees will be grateful and more productive. If you have any questions or need ideas about your company picnic, please contact us! ...let your employees and customers know that their efforts are noticed and appreciated! Picnic World's quality products are an excellent way to let your employees and customers know that their efforts are noticed and appreciated. Many of the quality picnic products available on Picnic World have been designed to accommodate corporate identity, allowing you to create impressive promotional or gift items for your employees and corporate accounts. We offer customization on most items, utilizing signature colors, silk screening, embroidery, leather patches, metal tags, laser engraving, and hot stamping. And of course, significant quantity discounts are available for large orders. Please visit our Customized Corporate Gifts page for more information!